Go ahead, drool over the photo, but I'll add just one more little bench note: insanely sweet! Line an 11” x 17” baking sheet with parchment paper. This step, for this recipe, is not optional: baked cocada will stick to anything other than parchment (foil, a greased baking sheet, etc.) and you will not be able to remove it post-baking. The parchment paper should completely cover the bottom and sides of the baking sheet. Set the lined pan aside. In a large mixing bowl, stir the sweetened, condensed milk, honey, corn syrup and vanilla together until well-blended. Fold in the coconut and mix by hand until coconut is uniformly distributed throughout the milk mixture. Spread the coconut and milk mixture onto the prepared baking sheet. Using a rubber scraper, push the mixture evenly across and into the corners of the pan. Bake for 25-28 minutes. 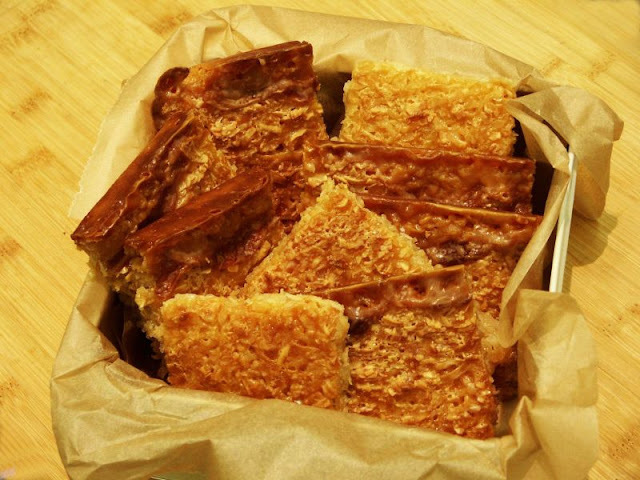 The cocada will bubble as it bakes and turn a deep golden brown, with the edges becoming especially dark – it is done baking when the top appears golden throughout. Allow the cocada to cool and set for at least two hours. Using a sharp, lightly oiled knife, slice the cocada into squares, carefully remove each piece from the parchment lining, and enjoy straight away or store in an airtight container. "And because I would not salute anybody, I had to join the Timber Corps." She emigrated to Canada in 1953 and after four years, felt it was time to move on. On her way to visit a friend in Jamaica, she stopped off in Port au Prince, Haiti. There was a revolution going on. "And there were all sorts of guards in the airport, with their guns. [So I went to the hotel], and the first person I saw was Paul. And he was to be my future husband." Paul Kennedy was a New York Times correspondent and after their marriage in 1957, they lived in Mexico. So not only did Diana have a new husband, but she found her calling. She developed a great interest in Mexico and its food and began to study, cook and write down Mexican recipes and ingredients. In 1966, they moved to New York. Paul died of cancer in 1967. At the suggestion of Craig Claiborne in 1969, Diana started teaching Mexican cooking classes in New York. An editor heard about them and asked her to write a book. "I said okay, but I can't write," Diana recalled. She sent in her first pages, and then came down to Mexico to do further research, deciding to rewrite the book. The editor read the result, then called and told her, "Diana, what did you do over the summer? You taught yourself how to write." Published in 1972, "The Cuisines of Mexico" carries the dedication, "To my beloved Paul, who was my reason for being in Mexico in the first place." 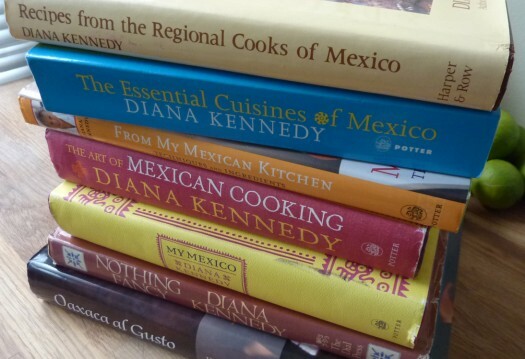 She was referred to back then as, coincidentally, a "Game-Changer" because our understanding of Mexican food was never the same after that book was published. Diana spent more than half the next 7 years travelling intensively to do research for future books. She says that every book has reflected a different time of her life. You will discover in all of Diana's books a respect for Mexico and Mexican cooking. "You can see why a cookbook is so difficult and so laborious," she said. First there's the research, then the cooking and only after everything has been fully tested can the writing happen." Her last book was about the cuisine of Oaxaca in southern Mexico. When asked if she was going to do yet another book she said: " I’d like to make a pact with the devil. I’m very old. No, I don’t think I would do another. What I’m going to do now is direct my attention to the uses of the edible wild plants, whether they be flowers, fruits, leaves, roots—whatever. " Diana has also talked a bit about doing a book about Michoacán, her home since 1980. It's an adobe home on seven acres, mostly wild. Gardening is organic -- "There's no need not to be" - and nothing is wasted. Anything that can't be fed to the chickens goes to the compost pile, and, if it can't be composted, it's carted off to a sanitary landfill. In 2003, Diana traveled to England to receive the Member of the British Empire from Queen Elizabeth, awarded for improving British-Mexican cultural relations as well as her environmental activism. "The ones I cook from are The Cooking of Southwest France, by Paula Wolfert, and her Eastern Mediterranean. Obviously we all go to Julia Child for the details. And [some of what] Jacque [did] in the early days, Jacque Pépin. Oh, and, Maida Heatter’s cookie book. I think that’s a phenomenal book! So I’ve done a lot of those, but I always have to reduce the sugar and put more fat in it. Oh, another book that I love and I use, I cook all from it, is Carol Field’s The Italian Baker. It’s a phenomenal book. All the breads, the different pastries. You know, I cook. I’m a cook. People don’t realize that, but everything in my kitchen, I make. Pickles, everything. I’ve got pickled lemons, I’ve got English chutney — everything, I make. And that, to me, is the test of a cook — to know how to do everything. So all my bread, I make everything. I’m a cook." Diana is known for her withering appraisals of competitors. The "Julia Child of Mexican Cuisine" is not a celebrity television chef, or a restaurateur with customers to pamper so I guess it's not necessary to be nice. 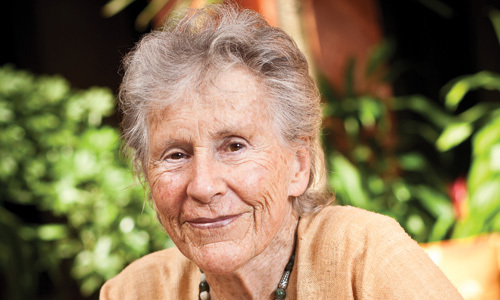 "She is a dogged, obsessive pop anthropologist who has spent the past 50 years traveling to some of the most remote corners of 'my Mexico,' as she calls it, wrangling home cooks to reveal their secrets with the imperial attitude." One interviewer was visiting and relates: "All the while, Kennedy complains. She complains of flu. She complains about poblano peppers from China and apples from America. "Outrageous!" She isn't happy about the state of her chicken house. She regrets deeply the rise of the Mexican industrial tortilla. She calls her gardener lazy. Warns us twice about the toilets. Gets really mad when someone tries to serve the women first. She apologizes for being prickly but doesn't stop." In David Kamp's 2006 book about the foodie revolution, "United States of Arugula," there is a funny passage about Rick Bayless meeting Kennedy for the first time in Mexico. "She did everything but just chew me up and spit me out," Bayless recalls. "I'd never been so poorly treated by any person. She said, 'This is over, I think we're done,' and kicked me out of her car and left me on the road. I had to walk back to town." This dish reminded me of an old favorite my MIL used to make. A roasted fruit compote...which I posted HERE. 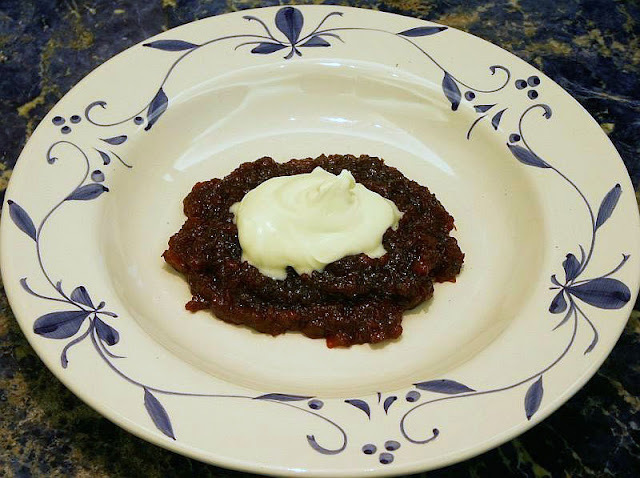 It's composed of caramelized fruit, topped with sour cream to cut the sweetness. It takes about 2 hours in a slow oven. I consider Diana's dish the Caribbean version, as it is made with pineapple and bananas rather than canned peaches and dried apricots. The mixture is quite watery to begin with and nearly fills a baking pan. I used one that was 9 by 11 with sides about 2 inches. It also bakes in a rather (I thought) hot oven (350) for 4 hours. I kept a close watch on it not knowing what to expect. About 2 hours into baking, I lowered the oven temp to 325. Still, even then, it was easily done in three, not four, hours. You need to do quite a bit of stirring the last hour and a half to keep it from burning around the edges. When it got extremely thick and dark in color, I removed it from the oven. The flavor is amazing. Diana suggests serving it with creme fraiche, but if you don't have any, use sour cream. I like my MIL's dish served a bit warm with cold sour cream and think ideally this should be served that way as well. 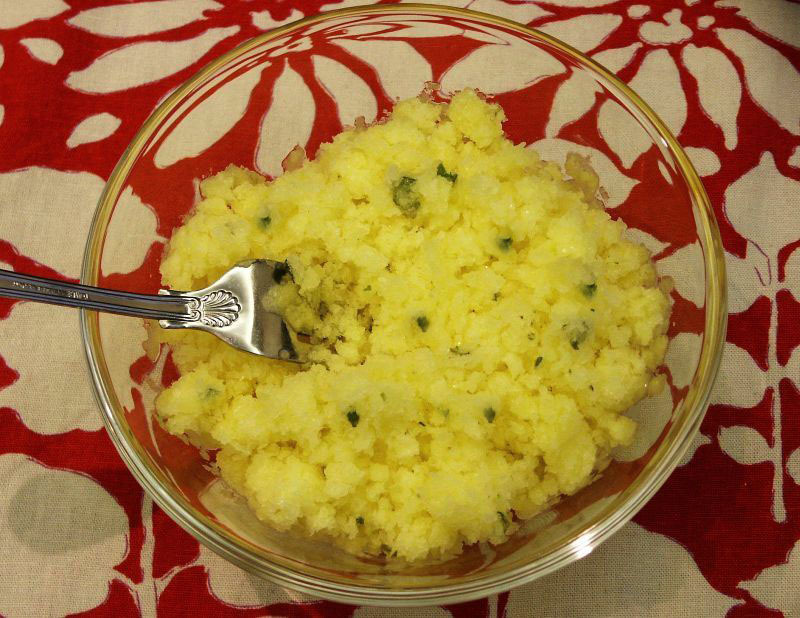 In the cookbook, Diana tells about being introduced to this dish by her first Mexican maid, Luz. She neglected to ask her for the recipe and after much searching, finally it found years later in an 1895 cookbook published in Guadalajara. Method:Pre-heat the oven to 350. Boil water, sugar and cinnamon stick together for 20 minutes. Liquid should be reduced to about 2 1/2 cups. Remove the cinnamon stick. Clean, peel and dice the bananas and pineapple. Puree all the prepared fruit with the syrup in a blender or food processor, to a medium texture. Put the puree in a roasting tin and add the second piece of cinnamon and the lime zest and juice. Place in the oven. Leave to cook for 4 hours, periodically scraping down the sides of stirring with a wooden spoon until the mixture becomes a rich dark brown. Remove from the oven, cool and serve with queso fresco or thick sour cream. The cooking can be started on the top of the cooker to speed things up, but it must be stirred all the time to avoid burning. 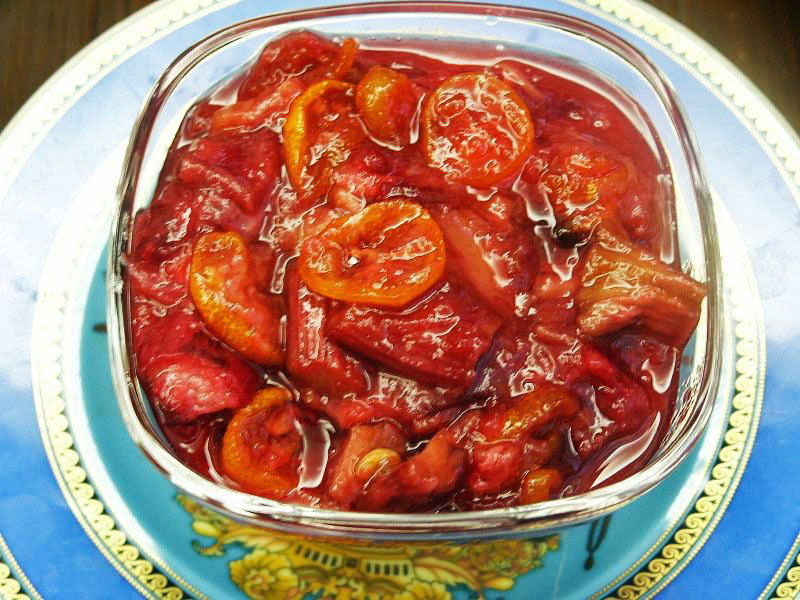 Roasting vegetables or fruit always results in intense flavors, so when I ran across this rhubarb compote recipe in David Tanis's Platter of Figs, I knew I found a winner. 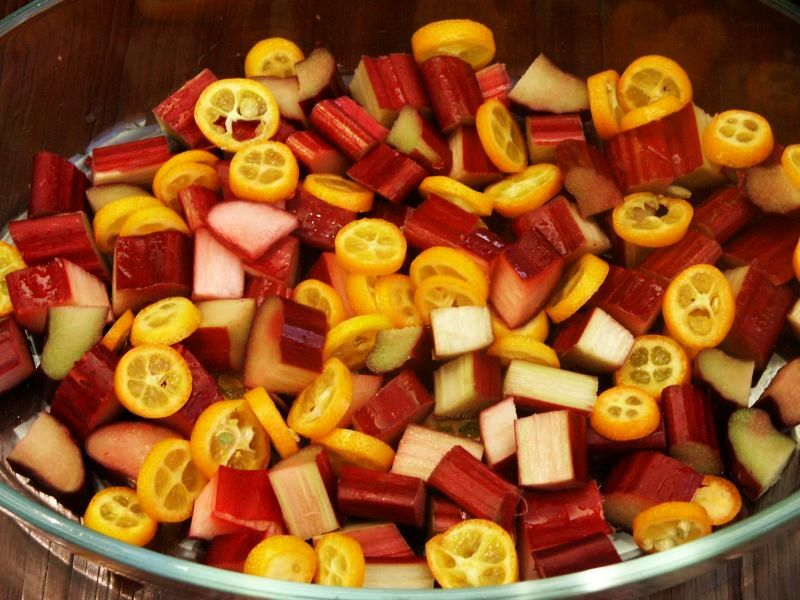 The kumquats add a lovely orange punch to the rhubarb and I love the many ways to serve this dish: as a side like applesauce, with crème fraîche or vanilla ice cream for dessert, or layered to make a trifle. Trim and destring the rhubarb and cut into 2 inch pieces. Add the sliced kumquats, toss them with the sugar and place everything in a shallow baking dish. Bake for about 45 minutes until the rhubarb is soft. Let cool and serve at room temperature. 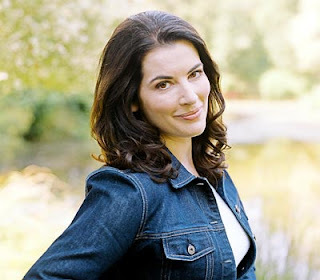 Nigella Lawson is the daughter of Nigel Lawson, the former Chancellor of the Exchequer, and Vanessa Salmon, a socialite, celebrated beauty and heiress to the J. Lyons & Co. fortune. She reports her mother was the kind of cook whose food tasted fine, but she didn't bother with appearance and never consulted a cookbook in her life. "When I was growing up my mother had eating disorders. Thinness mattered a lot to her. It was anorexia and a period of bulimia, I think, I can’t be sure. She became a pusher of food and family meals were a source of great stress, an endless power struggle. I vowed I was never going to be like that." Nigella worked for Harrods in her student days, which she liked because of the "feeling of belonging" it gave her. Lawson did a lot of reading and wanted to write the great novel of the 20th century. She has often spoken about how unconfident and melancholic she was as a youngster; how dumpy and lonely she felt. "My parents were very young, and more interested in each other than in us." Nigella eventually secured a place at Oxford to read Medieval and Modern Languages, achieving a Masters degree in the subject. Nigella was indirectly helped by her father and his Tory colleagues in her chosen career: she joined the Sunday Times literary team. In 1986, she became the deputy literary editor of The Sunday Times, before turning freelance and writing for such publications as The Guardian and Daily Telegraph. It was when Charles Moore, then editor of the Spectator, asked her to write about something else that she first stumbled into food. She became the magazine's restaurant critic. During her time with the Sunday Times, Lawson met journalist John Diamond who was also writing for The Times. They married in Venice in 1992 and had two children together: Cosima and Bruno. 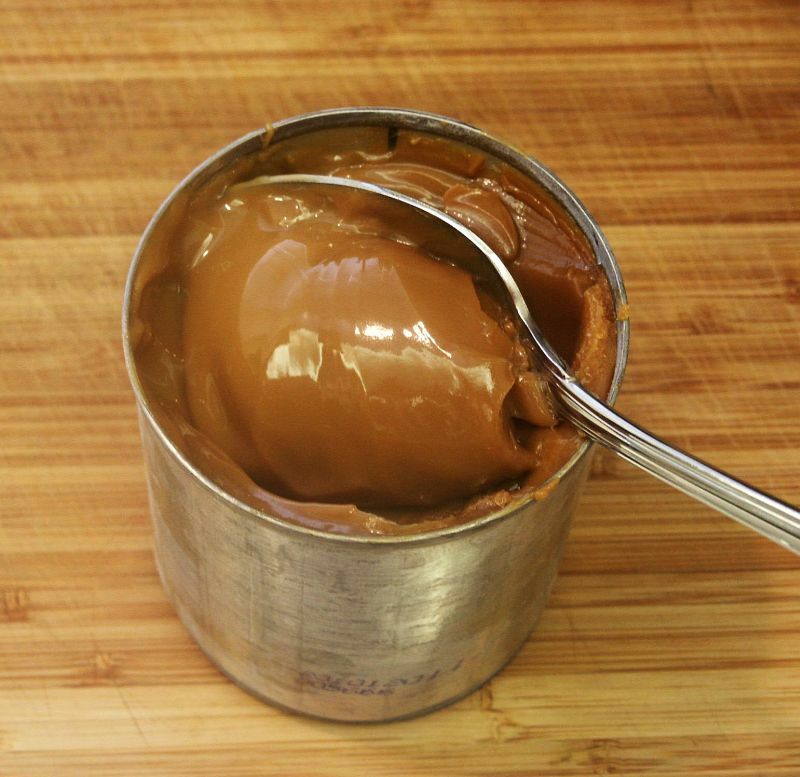 Lawson conceived the idea of writing a cook book after she observed a dinner party host in tears because of an unset crème caramel. How to Eat was subsequently written in 1998. Then, the idea for the first TV show came about because a glossy UK magazine wanted to run an excerpt. Nigella: "The book had no pictures, so we did a shoot in my home for the magazine. We really had fun; I had my kids there, and one photo was my feet in shocking-pink kitten heels, and some were of food, and the whole feel of it was warm and messy and fun." The Nigella Bites series won Lawson a Guild of Food Writers Award. She went on to write her second book in 2000, How to be a Domestic Goddess, winning her the British Book Award for Author of the Year. It was at this point in her career that that illness struck her family. Her husband John died in 2001 after battling cancer for over four years. She had also lost both her mother and sister to cancer in the late 90's. Grief is never over, she maintains. Back to work, Nigella repeated her successful TV series and book formula in 2002, with 'Forever Summer'. Nigella married the art lover and collector, Charles Saatchi, in 2003. 'Nigella Feasts' aired in the US in autumn 2006 and she then signed a contract with BBC for a three-part series 'Nigella's Christmas Kitchen', which aired weekly in December of 2006. This show enjoyed record ratings and Nigella was awarded a second World Food Media award in 2007. We all enjoy watching her and as a result, her career continues successfully. "Men like to look at her, women want to be her. She's the woman who has it all - the career, the children, the looks, a rich art dealer for a husband, her own TV show. She is a media celebrity, much photographed, everything from the death of her first husband to her waistline pored over by the press. She loves food, doesn't torment herself dieting, and mostly gets away with it." If you'd like a list of her cookbooks, check HERE. On Mirrors: "I am not a mirror person," she says. She only ever looks at herself a small section at a time, and then only if she has to, as when doing make-up. "Why would you want to look in the mirror? If you feel good about yourself, go on that, because you're never going to look as good as you feel. And when you feel bad about yourself, you don't really want to have any evidence." On cookbooks: I am a complete food book junkie. I now have over 4,500 food books and I love reading them. On celebrity: "When people call me a celebrity chef, I just feel like I'm going to commit suicide." Strictly speaking, Nigella isn't a celebrity chef because she isn't a chef. But she is at very least a celebrity cook. No, she suggests, that's wrong. There's something different, finer, more philosophical, to what she does. There is so much more to food than food, she says. "Food is about how people see themselves, it's about life. The thing I liked about writing about food when I started it was that I felt I was writing about food in a different way. Not like a food writer." 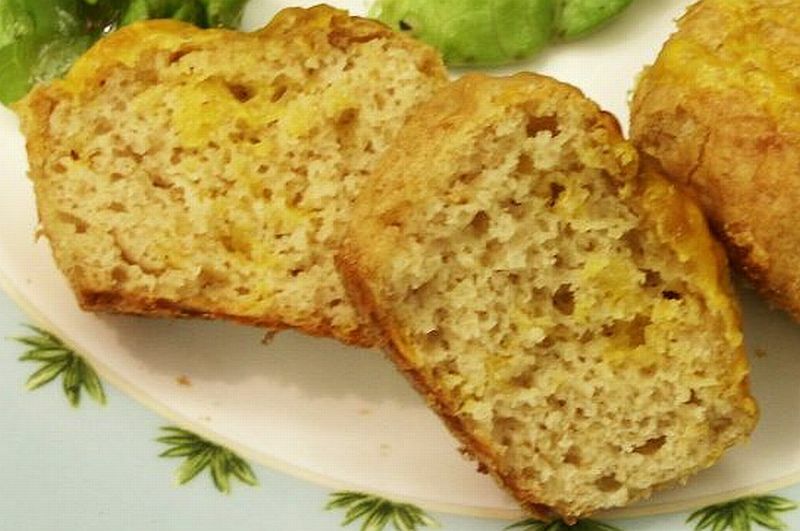 These muffins sound wonderful, don't they? And they look good too. 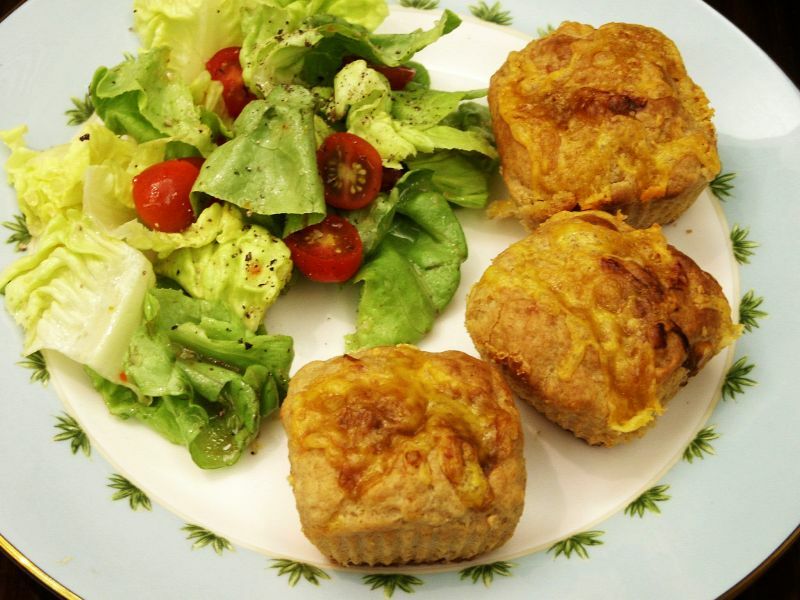 I've always loved Welsh Rarebit and this was such a novel idea for a brunch muffin I couldn't resist. Unfortunately, I was disappointed with the recipe. A couple notes: increase the cheese in the muffin batter to 3/4 cup. And find a really fine sharp English cheddar. I used an American sharp cheddar, probably not the best choice. The muffins just didn't have enough flavor. No zip. I'll try them one more time using not only more, but a finer quality cheddar. And perhaps increase the dry mustard a tad. It's a wonder I had enough liquid left to make ice cream. I kept taking spoonfuls of it out of the fridge while it was chilling! Roll your eyes and say Mmmmmmm! moments. Of course you know how I love rhubarb. And ice cream. My mother used to make a frozen raspberry chiffon pie with a crumble crust. 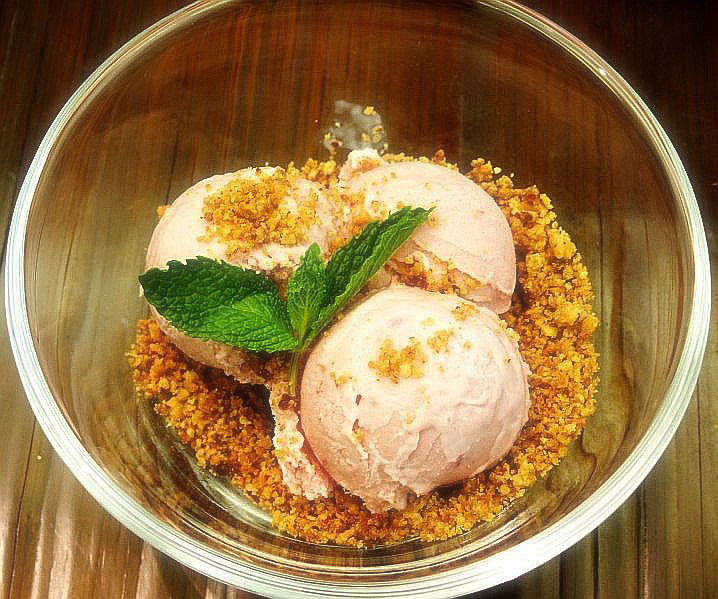 I thought that crumble would be perfect with a scoop of this fabulous ice cream sitting on top. It was. In a saucepan, combine rhubarb and 3/4 cup sugar. Cover and cook over low heat until rhubarb releases its juices, about 5 minutes. Uncover and cook over medium heat, stirring frequently until most of water evaporates and rhubarb has a soft jam like consistency, about 20 minutes. Transfer to a bowl. Whisk egg yolks lightly. In a saucepan, combine milk, cream and remaining 1/4 cup sugar. Heat almost to a boil, but don't let it boil. Gradually whisk milk mixture into yolks. Return to saucepan. Cook over low heat, stirring constantly, until thick enough to coat back of a spoon, about 10 minutes. Using a fine-meshed sieve, strain into a bowl. Add rhubarb mixture and cream. Refrigerate for at least 2 hours or as long as overnight. Freeze in an ice-cream maker to manufacturer's instructions. In a large baking pan stir the melted butter, brown sugar, flour and nuts with a fork. Bake at 400° for 15 to 20 minutes, stirring frequently. Set aside to cool. After about 10 minutes, crush the pieces with a fork to make a nice crumb consistency. Well, here I am again, posting something the Fridays with Dorie group did ages ago. Kind of a funny story with this recipe. 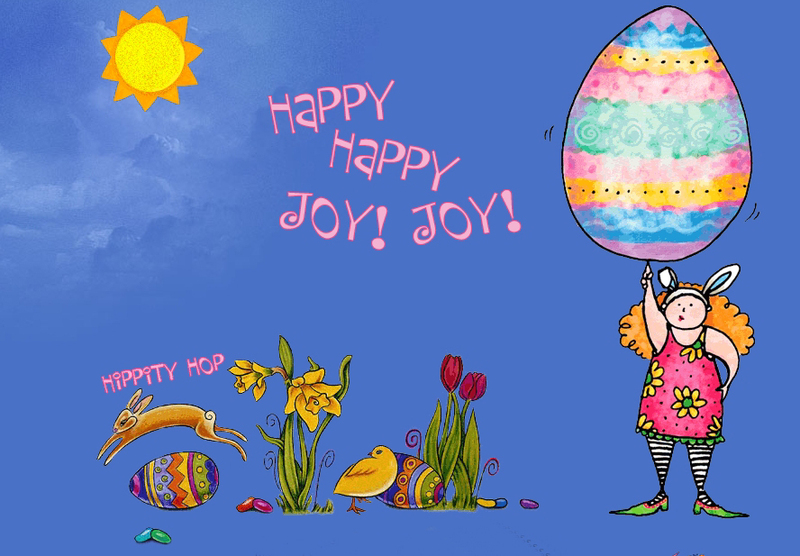 I took it along to an Easter potluck. Probably not the smartest thing to do when I'd never made it before. It sure looked pretty, but after comparing it to photos online, mine seemed to be a bit browner on top. Perhaps I cooked it too long. I took some photos for the blog anyway and then hopefully took it along to the dinner. When we cut slices, there seemed to be lots of crust and not much custard. I did use a larger tart pan than suggested but thought I increased the custard ingredients sufficiently. Guess not. Everyone said they loved it (such polite friends), but I was honest and admitted it hadn't turned out the way it should. So, because there were still enough ingredients left to make a couple small tarts, I decided to make the recipe again and try to figure out what happened. Of course, these tarts turned out perfectly. Wouldn't you just know it? Especially when I was the only one to see the perfect result. And of course, now....you. I know you can't taste these, but take a gander at that last photo. Plenty of custard there, even in so small a tart. :) Trust me when I say these are delicious. And I don't even like mustard. My error must have been the custard to tart pan ratio...the only other thing I changed the second time was to use heavy cream in place of creme fraiche. I will be making this again. 1 9- to 9½-inch tart shell made from a tart dough of your choice (I always use Ina Garten's recipe, see below, because it has Crisco AND butter in it which I think results in a flakier crust.) partially baked and cooled. 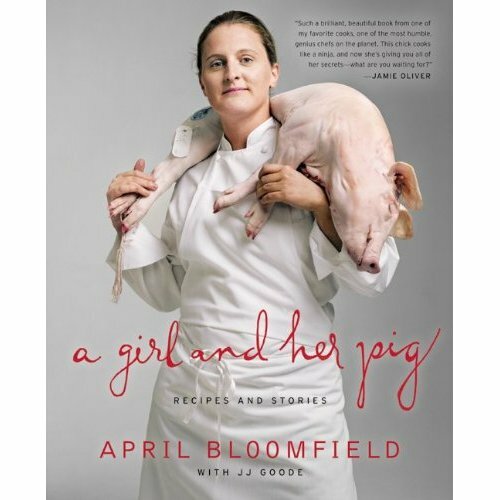 April Bloomfield was born in Birmingham, England in 1974. Her mother painted ornate candy dishes for Halcyon Days and her stepfather was an engineer. 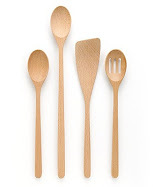 This was not a foodie family. Her mother's cooking left a lot to be desired, but April remembers some of her grandmother's dishes with fondness. She was giving some thought to becoming a policewoman, but got sidetracked when she saw her sister in chef's whites. "Maybe I could give cooking a go, she thought. But when I walked into college, and saw the kitchens and smelt the spices, I knew I would give it 110%. I was just blown away." Her first job was at a Holiday Inn, followed by several other restaurants while she learned her craft. At one point, she worked at Bibendum and still speaks with reverence of Simon Hopkinson, who was chef there. But eventually April wanted to spread her wings and her dream was a job at the River Cafe. She called a friend who worked there and: "They told me to come in, and I loved it from the moment I tasted the food. It was this pasta… I had to peel these walnuts. I'd never seen a wet walnut. My fingers were burning, but I was so happy. We made a sauce from the walnuts, some bread, the water I'd blanched them in, some pesto and some spicy oil. Tossed it into some tagliatelle. When I tasted it, my palate moved to a higher consciousness. I actually thought: what have I been doing for the last 10 years? I was so worried I wasn't good enough to get a job there." In the meantime, in NYC, Ken Friedman, who'd been in the music industry for 25 years began a new career. His friends suggested Mr. Friedman open a restaurant, because he had always been a foodie. Mr. Friedman ran the idea by Mario Batali, who agreed to help. So he and Mario Batali began searching for a chef. Jamie Oliver was their choice. Batali, a pal of his, and Friedman took him out for the evening. According to Batali, Oliver turned them down but suggested they meet with a young British sous chef at his old employer, the River Cafe. Her name was April Bloomfield. Bloomfield flew out to New York, which she had never visited before, for an interview. A little to her surprise, this consisted of a 10-hour marathon during which she and Batali and Friedman ate at some of the city's best known restaurants. “Mario said, ‘Look at her arms. They’re all burnt, which means she has no fear. Plus, she has a sense of humor,’” recalled Mr. Friedman. Bloomfield handed in her notice, and moved to the US, where she spent the summer working at Alice Waters's restaurant, Chez Panisse, to become familiar with American ingredients. Then she headed to New York where she and Friedman opened their gastropub, the Spotted Pig, in 2004. The menu was meaty, and rather British. She and Ken did not agree right away about what kind of food they would serve. "He wanted to do tofu hot dogs. I was very concerned. I sent him an email telling him what I was most passionate about, and I ended it by saying: look, I might not be the right chef for you." Ken promptly backed off, and has left her alone ever since. He deals only with front of house, leaving April, who is emphatically not a schmoozer, to get on with her work. This suits them both. Friedman says: New Yorkers didn’t quite know what to make of it. Was it a bar with good food? A restaurant that was fun? In any case, it was an immediate hit. April Bloomfield is one busy woman: not only head chef at The Spotted Pig, but at the wildly popular Breslin and the new John Dory, Vol II. The latter two eateries flank Ace Hotel New York and are an integral part of the nightlife here. The Spotted Pig and The Breslin both received coveted Michelin Stars this year. She also has a book coming out this month. No problem choosing a recipe this week! I've read about this pie and those divine ingredients. 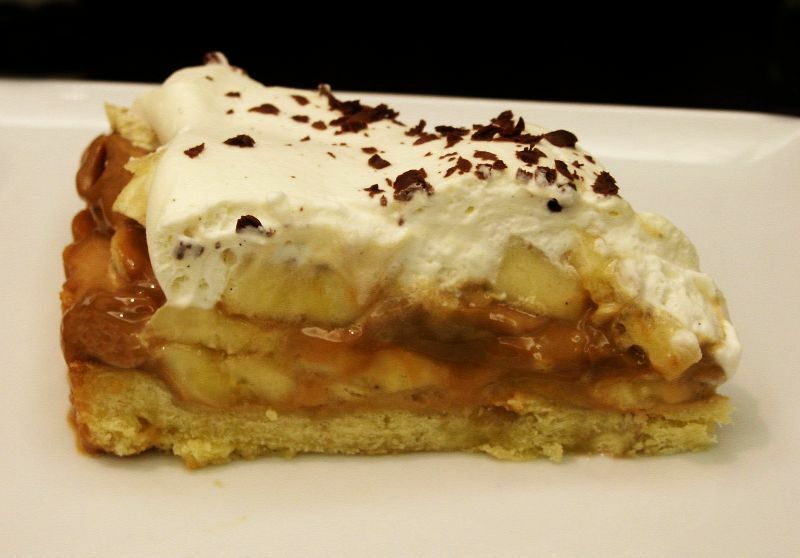 What's not to love about dulce de leche and bananas? 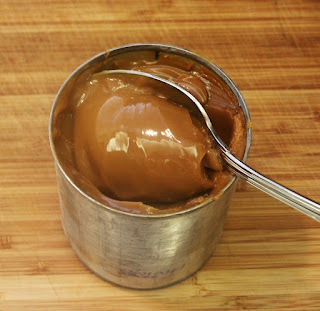 Place the unopened cans of condensed milk in a saucepan, and cover with water. Boil for 4 hours, checking the water level occasionally to ensure the cans remain submerged. Remove the cans, and allow to cool overnight. Sift the flour into a bowl; add butter, salt, and 1/2 cup sugar. 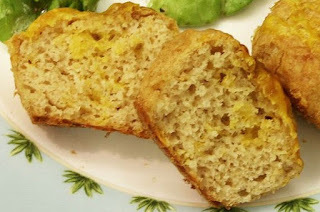 Rub the butter into the flour until it resembles fine bread crumbs. Add the egg yolks, and knead until the egg is incorporated and the dough is smooth. Form the dough into a ball, wrap tightly in plastic, and refrigerate for 1 hour. Cut the dough into 2 or 3 large pieces. Grate the dough on a large-tooth box grater set over the base of an 11-inch tart pan, and press it evenly around the base, then the sides. The dough should be a little less than 1/4 inch thick on the base and 1/2 inch thick on the sides. Prick the bottom with a fork, and then freeze for 15 minutes. Preheat the oven to 350 degrees. Bake the pie for 15 minutes or until brown all over. Allow the pie shell to cool. Peel and thinly slice the bananas on the bias. Arrange half of the bananas in concentric circles, starting from the outside and working your way to the center. Open the chilled cans and gently dollop the caramelized condensed milk onto the bananas, spreading it evenly. Follow with another layer of bananas. 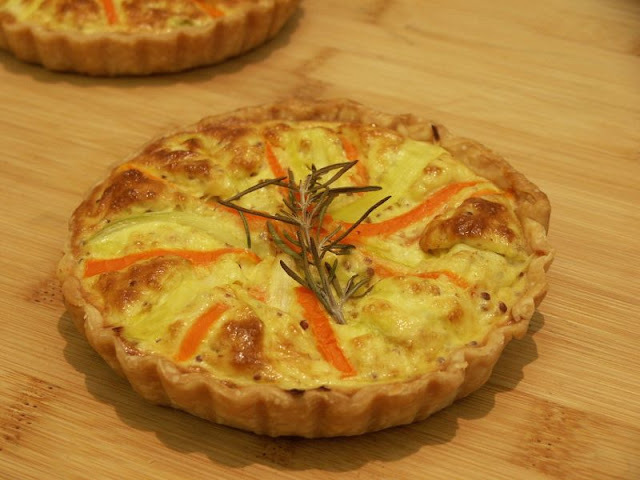 Cover the tart with a tight layer of plastic wrap, and chill in the fridge for 15 minutes. While the pie is chilling, whisk together the cream, vanilla seeds, and remaining 3 tablespoons of sugar until soft peaks form. Remove the pie from the fridge, and spread the whipped cream on top, completely covering the bananas. Sprinkle grated chocolate over the pie, and chill in the fridge until ready to serve. What a fun, refreshing recipe! And simple to make. All granitas are, I've always thought, which makes them perfect for summer. Yet another plus: compared to ice cream, they're so much lower in calories and the flavor of fresh fruit shines through. 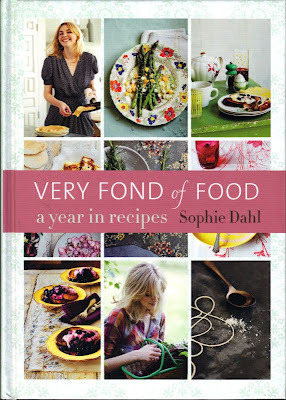 This recipe is from Sophie Dahl's new book. I have about 8 post-its stuck in it already and no doubt there will be more. Most of her recipes are not complicated but loaded with flavor. With this recipe, you could use canned or bottled pineapple juice, but please don't because fresh pineapple is amazing in granita. And the one I used was so nice and sweet, I didn't need to add any sweetener at all. Put the pineapple chunks in a processor and process until you have mostly juice. Strain through a fine sieve. Pour boiling water over the mint, remove and quickly run ice cold water over them. Dice finely and add to the juice. Taste and sweeten if necessary. Freeze in a shallow metal container for 2 hours. Check on it and run a fork tine through to break it into shards. Refreeze. Serve by running a fork through again right into glasses. This recipe has been on my radar a long time. It was originally on the cover of the April 2007 issue of Bon Appetite Magazine via their RSVP column and the recipe came from Jamie's Restaurant in Pensacola, FL. I tore out the recipe, stuck it in my file and finally got around to making it last Easter. 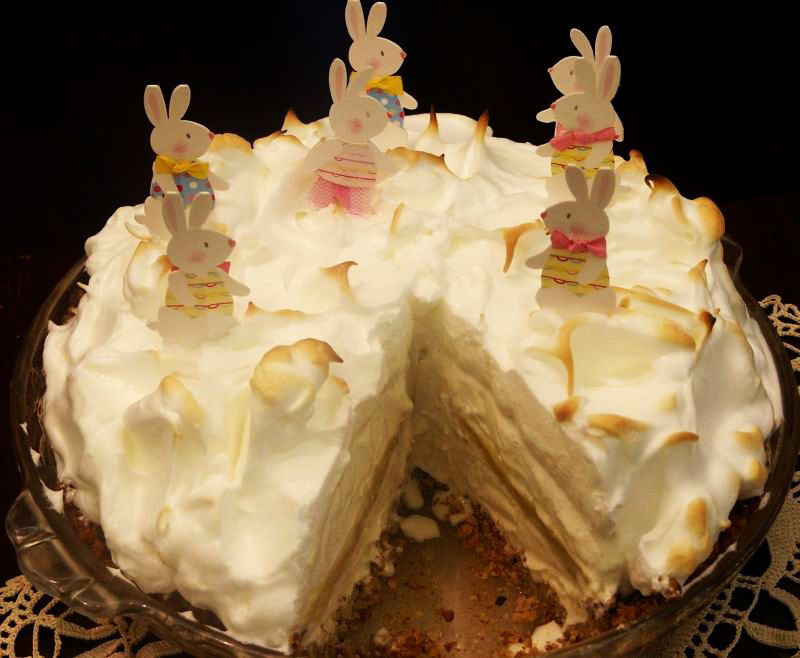 My little bunnies were very happy floating in the meringue and my guests were very happy to dig into this pie! 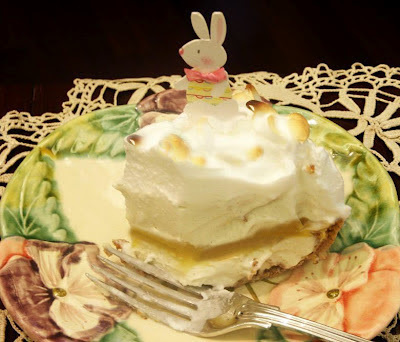 Susan from Savoring Time in the Kitchen posted the same pie last summer and she noted what a great summer dessert this was. I agree. To save time you can use store bought lemon curd and ice cream. The crust is fabulous. Make the curd according to instructions and chill for a few hours to firm up. Preheat oven to 400. Mix the pecans, sugar and butter together until moistened. Press the pecan mixture on the bottom and up the sides of a 9” diameter glass pie dish, the mixture will be crumbly. Bake until the crust is slightly toasted, about 12 minutes. The crust will have slipped down the sides, use the back of a spoon to press it back in to place. Cool and then freeze the crust for 30 minutes. Dollop 1 1/2 Cups of the softened ice cream over the crust, and spread into an even layer. Spread lemon curd over the ice cream and freeze until firm. About 1 1/2 hours. Dollop the remaining ice cream over the lemon curd, and freeze again. You can do this in advance and finish it with meringue when ready to serve. Preheat oven to 500. To make the meringue, beat the egg whites with an electric mixer until frothy, add the pinch of cream of tartar and gradually add the sugar while mixer is running. Beat until stiff peaks form. Spread the meringue on top of the pie in an even layer. Place the pie in the oven until meringue is golden in spots, about 3-4 minutes. You could use a butane torch as an alternative if you own one. Cut and serve immediately. Increase the heat a VERY LITTLE bit and cook over moderate heat, whisking constantly, until the mixture thickens and just begins to become jelly-like. It’s done when you lift the whisk and the mixture holds its shape when it falls back into the saucepan from the whisk. For me, this took about ten minutes in a 12” pan. Immediately press the curd through the strainer. Once strained, store the lemon curd in the refrigerator.